Next Meeting: Wednesday, August 14 2013, 6:30 p.m. – 8:30 p.m.
We meet at the Unitarian Universalist Society Church located at 152 Pearl Street in Burlington, VT. We will be in the Sophia Fahs Community Room, a large room located in the basement. Click here for more information on directions/parking. 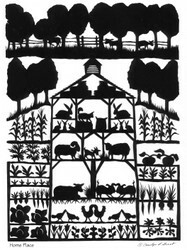 Our August evening will include a “Trunk Show” sampling of work by paper cut artist Carolyn Guest. Carolyn creates original art by cutting paper with sheep shearing shears – a rudimentary tool that continually challenges her to push the limits of fine detail in her designs, which are inspired by her rural heritage. Carolyn has also chosen to cut with sheep shears to honor her Polish teachers and the women who have had to make do with what they have. In addition to her rural designs, Carolyn also cuts silhouettes of individuals in person using a “look and cut” technique to capture a person’s essence in profile, using her scissors to “draw” as she cuts. After a short presentation about paper cut art, Carolyn will demonstrate her techniques for paper cutting, followed by a hands-on mini workshop creating one of a kind story board cuttings. Bring your favorite cutting tools and pencils to join in on the evening’s adventures. Paper and extra small scissors & a few pair of sheep shears will be provided. Erin Sweeney wowed us all with her amazing artist’s life story and work at July meeting. Truly an inspiring presentation, she shared slides of her hometown as well as her work, and gave us insight into what shapes her thinking. Then on to some hands-on demonstrations easy enough for us all to follow. Best of all, she provided us with cool paper of her own prints! We ran a little late because we just couldn’t stop folding. We all came away with a fold book, a pocket model, a stage with marquis model, and a slipcase to hold them. Special thanks to Erin! The Monadnock Paper Mill, located in Bennington, VT, makes a 70lb text paper called Astrolight Silk that is a good weight for making paste paper. The French Paper Company has a variety of good quality papers for projects. Impractical Labor in Service of the Speculative Arts is a membership organization for those who make experimental or conceptual work with obsolete technology. Erin is rather fond of the group. You can view images from the meeting on the B.A.G. blog. *** Several members of the Book Arts Guild of Vermont will be represented at the Artistree Gallery in Woodstock, Vermont. 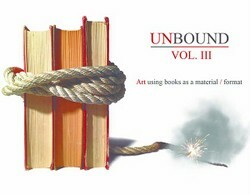 Included in the show, UNBOUND VOL III, are works by Amy Burns, Dorsey Hogg, Ann Joppe Mercure, Debra Kraemer, Lorraine Reynolds, Carolyn Shattuck, and Marcia Vogler. The broad theme of UNBOUND VOL. III encompasses all of the possibilities of what we may think or may not think a “book” is. Is it story? An entry to another world? An exploration? What does it indicate? This show, juried by Erin Sweeney, looks to explore this idea of “the book” and all the ways artists use that format as a stepping-off point or as material to explore new ideas. The show runs from July 26 – September 7, 2013. *** B.A.G. is introducing a new membership option for those who wish to join later in the year. We now have a July – December membership for only $20.00, which is cheaper than paying $5.00 for each of the five remaining meetings. We hope that this will encourage you to join B.A.G. as a member and take advantage of the many benefits we offer. *** Are you looking for an opportunity to participate in the Burlington Art Hop but don’t know how? Do you have work that you think could sell at an artists’ market but maybe you don’t have enough inventory to have your own table? Here is a great opportunity to help represent the Book Arts Guild of Vermont and participate in the Art Hop at the same time – join us in a group table at the Art Hop Artist Market Extravaganza on September 7, 2013! The B.A.G. board has decided to cover the cost for the table, so this is now a free opportunity for our members! Participation is limited to the first 10 responding members. Please be aware that you must agree to our guidelines before committing to participation – please download the Art Hop exhibition sheet and review the terms before agreeing to participate. *** Bill Hanscom is teaching Enclosures for Preservation and Beyond on October 13, 2013 at the Simmons Graduate School of Library and Information Science in Boston. Boxes, wrappers and slipcases are widely used to house and protect library and archival collections, but they also offer terrific opportunities for artistic exploration. Beyond the protective housing of original artistic works such as books or print portfolios, enclosures can be altered and embellished to complement, enhance, and conspire with their contents. Over the course of this workshop students will work to create a reference set of enclosures which neatly nest together. For more information or to register, please send an Email to gslisce@simmons.edu or call (617) 521-2803. The workshop will be held at 300 The Fenway. 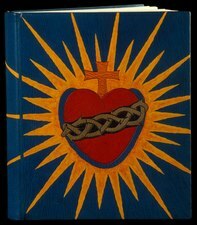 *** Daniel Kelm is offering Leather Onlay & Inlay at his studio, The Wide Awake Garage, in Easthampton, MA, August 17 – 18, 2013. Onlay and inlay are traditional techniques for design that still speak to us today. Both methods use pieces of leather to lay down fields of color. We will focus on a technique that stabilizes the leather sufficiently to produce onlay and inlay with clean, hard edges. Participants will each produce five models: four variations of onlay, and one inlay – all on leather-covered board. Details of paste production, leather preparation using the Schärf-Fix paring machine, knife selection, cutting surfaces, and onlay/inlay application will be covered. For more details, please visit Daniel’s website. 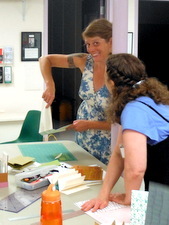 *** Carol Barton will be teaching Book Arts: Paper Engineering and Sculptural Binding at the North Country Studio Workshops from January 28, 2014 – February 2, 2014. This is an ideal session for book artists, teachers, graphic designers, and anyone who likes to play with paper. Discover the magic of the sculptural book through exploration of three-dimensional and pop-up forms. Learn how to use book structures to help convey your message. Participants will construct a series of pop-ups from simple to more complex glued structures, along with an accordion book, a carousel book, and a tunnel book.